I am so excited to introduce you to a very good friend of mine, Mika Perry. She is the epitome of beauty and elegance, and one the sweetest ladies I have ever met. Mika is a supportive wife, a mom of 3 beautiful little girls and she is an organizational genius. 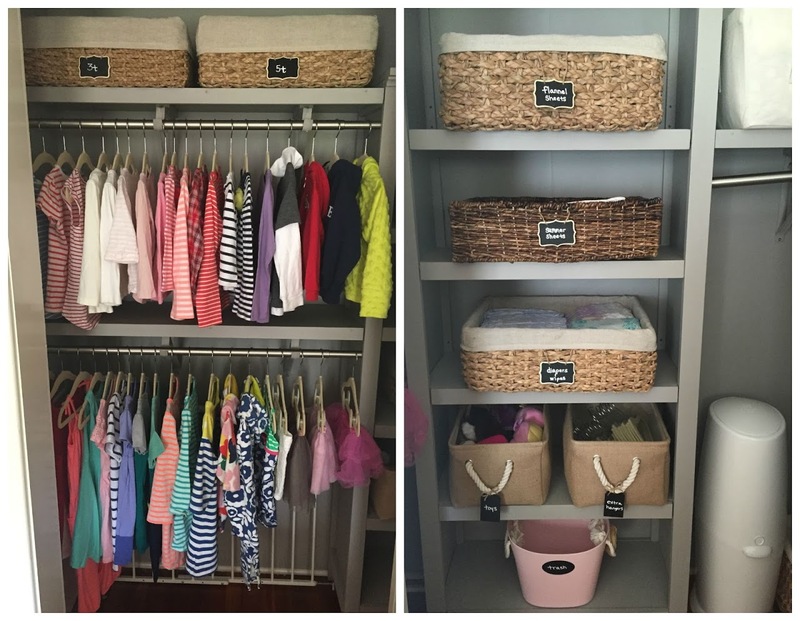 Literally, she is a professional organizer… talk about a dream job! Mika runs the Arizona market for NEAT Method, the nation’s largest luxury home organizing company, and trust me y’all, she is FABULOUS! She is living the NEAT life! Mika is taking over Espresso Ever After today to bless us all (yes, me included), with 7 nursery organizational tips and tricks. I am so excited to learn from the best! So without further ado … the NEAT lady herself, Mika Perry!!!! 1. Invest in Matching Hangers :: For an instantly streamlined look, invest in matching hangers. 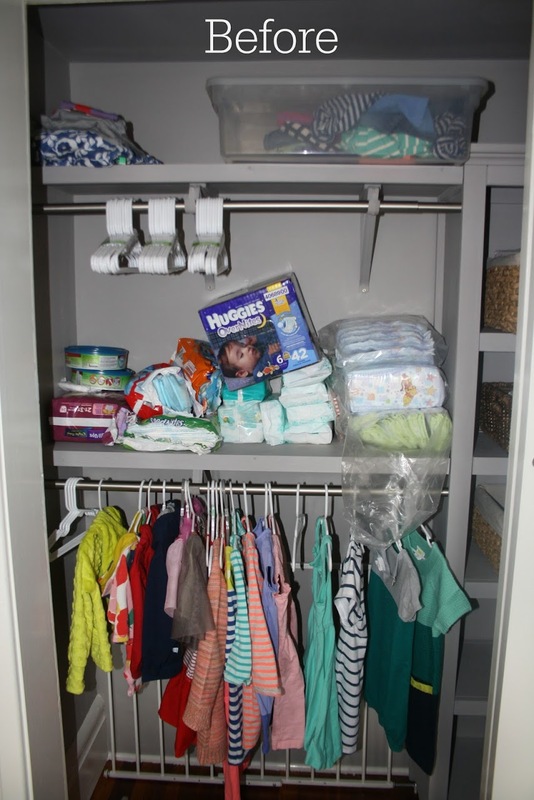 With nurseries we don’t find as many mismatched hangers as we do in master closets (like a variety of colored tube hangers mixed in with wire dry cleaning hangers) because it’s a new space and you typically bought them for the new baby all at once. However, over time you may start to accumulate a variety of hanger types as baby gifts or ones that the clothes come on from the stores – and you totally keep (we’ve seen those Target hangers out there!) Our favorites for nurseries are the slimline velvet hangers that come in cream and other nursery-friendly colors and take up less hanging space than typical hangers. You can buy packs on Amazon for a great price. 2. Label, Label, Label :: Knowing where to find items – and where exactly to put things back – saves time during hectic mornings and late-night clean-ups. Less thinking and more time is something all moms need, right?? There are SO many beautiful and creative ways to label out there right now, like chalkboard and paint pens and gorgeous tags in every color and material. But we always make sure to keep it simple and in line with the room’s design aesthetic. Bonus :: Labels can promote early literary skills with words to read aloud and letters to point out around the entire room! 3. Know Before You Buy :: That cute basket at Homegoods? PUT IT DOWN! 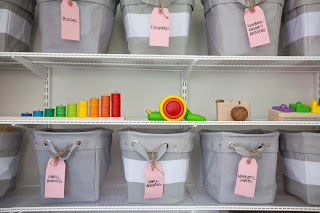 The most common mistake clients make when they have tried to organize on their own is they go out and buy random bins and baskets in hopes of “getting organized.” We see this all the time and it never works to try to implement what they have bought in advance of the organizing. Buying any type of organizational product is the very last step in every client space we work in. This ensures we won’t buy unnecessary items and what we do purchase is a perfect fit, saving time and money. First, we take everything out of the nursery closet, dresser, shelving unit, etc. to categorize what is there and edit out what no longer needs to be kept. Then, we place everything back while keeping in mind ease of accessibility and understanding ahead of time what you reach for most often. Finally, if there is an area that could use a bin or basket or divider to better store those items in that area then that’s when we measure out the space, write down exactly what is going in it, and then head to the store to buy a product that will fit that space and hold those items. Like a tailored outfit, nothing beats the look of a perfect fit. 4. File Fold for More Space :: In dresser drawers, file items vertically. To do this, take your typical folded onesie or tee and fold them once more, making it smaller but thicker. Place them in the dresser from the top and starting closest to you towards the back of the drawer – just like you would a file in a filing cabinet! This way, you can see every item you have at a glance and you can take them in and out without rifling and digging through all the other pieces. 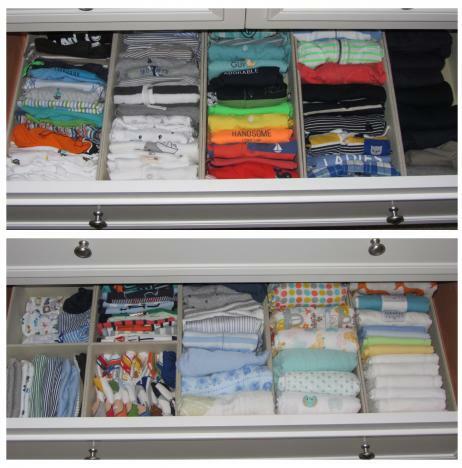 Bonus :: this method only takes up 1/3 of the space in a drawer compared to storing items on top of each other! 5. Take it One Area at a Time :: Be realistic. 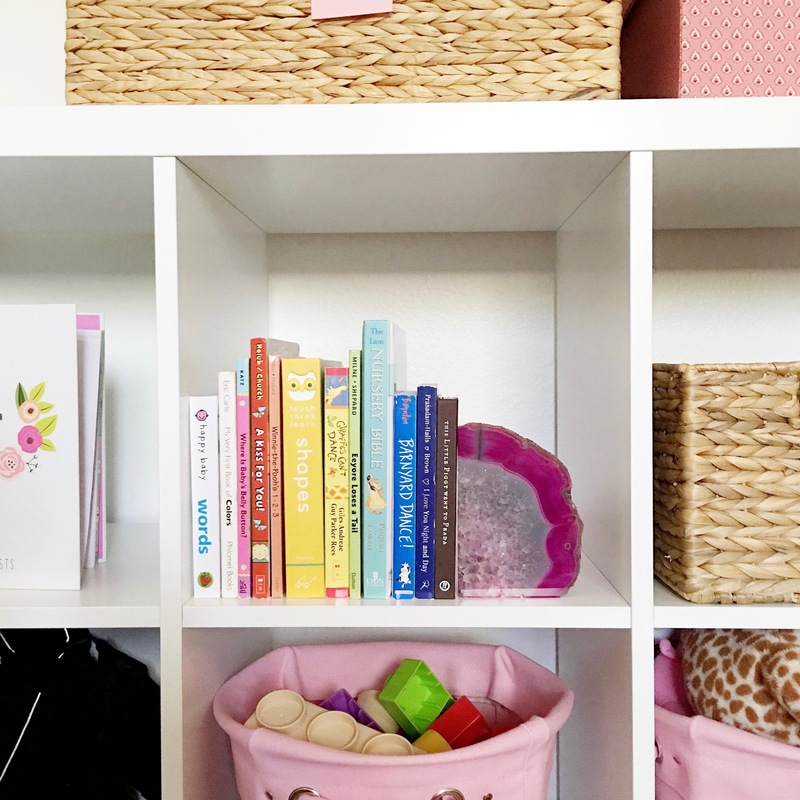 Most of us don’t have a whole day to devote to organizing an entire room, so take the time you do have and organize one area be it the hanging rod of the closet, or one dresser drawer, one toy basket, or just labeling. You can even set a timer for 10 minutes and do what you can in that time! If you do need to buy items like hangers, drawer dividers, or baskets, keep a list of measurements, categories, and counts of items so you can shop one small space at a time or all at once -whatever fits your schedule best. 6. Think Outside of the Box :: We tend to stay away from choosing organizing solutions that are made for a very specific item or purpose. Instead, we like to implement classic, well-made, neutral, and versatile items that can transition with the child and space as they grow. For example, rather than a diaper caddy for the changing table, an open basket can easily hold diapers and supplies now and can be used later with larger items or toys down the road. By the same token, don’t think something that’s made for a specific purpose HAS to be used that way. 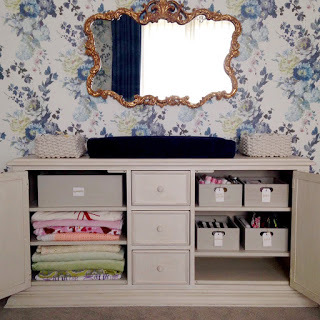 A lucite necklace stand or acrylic jewelry tray can hold headbands and bows beautifully, and a divider or box in the office section could be the perfect solution for organizing your changing table drawers. 7. When In Doubt, Color Code :: Remember ROY G. BIV from elementary school days? That’s the order of the colors of the rainbow – and basically how we arrange everything. Organizing by color creates that ultimate, organized look in any space. 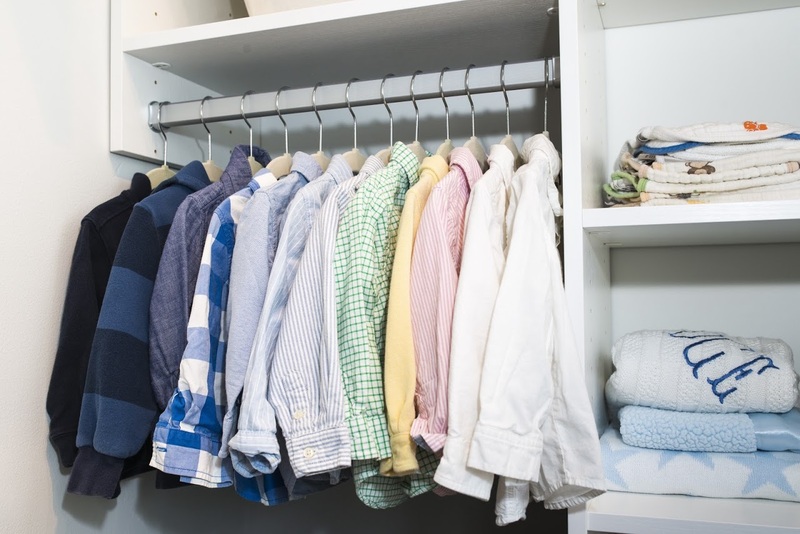 In the nursery, try it with the hanging clothes in the closet, file-folded onesies in the dresser, or the books on the bookshelf to bring an instantly NEAT look to the room! Fore more NEAT information and tips visit Mika Perry and NEAT Method at neatmethod.com. To catch up with Mika and her #momboss lifestyle, follow Mika on Instagram & Facebook. 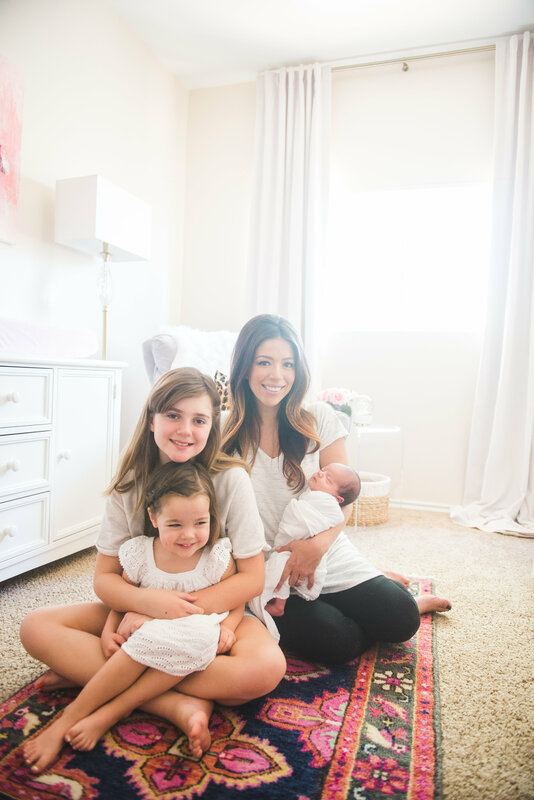 Her photos are swoon-worthy, she gives organization tips on the regular and it is so fun adoring over her beautiful family! NEAT Method has been featured in the following publications: Vogue, Forbes, The New York Times, Oprah, HGTV, and The Huffington Post… just to highlight a few. Mika was recently named as one of the “Readers’ Choice : Favorite Design Gurus” in Modern Luxury Scottsdale’s “Best of the City” issue. If you are looking for a NEAT Method near you, or organizational assistance, NEAT is located in 13 cities nationwide including San Francisco, Chicago, and New York. Mika, Thank you for being our guest blogger today! I am so honored to know you as a friend, and I am so thankful for all of your wise organizational tips. I can speak for all of us when I say…. you have NEAT-ly given us the much needed confidence and desire to add a little more organization to our lives … starting in our nurseries! Question for you : What are your favorite Spring Refresh organizational tips and tricks? Such a beautiful and organized space!! Love it so much now I need to go and orignize my closets!! Hi Faith, This is the perfect tutorial on how to get started on your organizing! Thank you for following Espresso Ever After!